The future of planet Earth lies in our hands. This is not just a cliché slogan, it is the hard truth. For life on Earth to continue, we need to start doing things differently… NOW! A simple Google search will provide many solutions to help you reduce your carbon footprint. Recycling is an easy and convenient way to do your part. Many solutions are available, but it is very important to research what works locally. Recycling trailblazer, Kabega Primary, set the bar high by recycling a total of 13736kg, which is a total of 15.19kg per learner! To put this into perspective, one can weigh an empty 2 litre plastic bottle (now do the math and imagine how much work the school has done). Not only does Kabega invest in their own green activities, but they encourage other schools to visit and learn from them. They truly are spreading the Green Gospel, TWTC couldn’t be prouder! Betel Christelike Academie started their recycling programme at school after visiting Kabega Primary last year. Their Groenhande club has worked hard to implement a culture of recycling at school. The school will be investing in environmental school outings for the Groenhande club and will also be purchasing lab equipment. 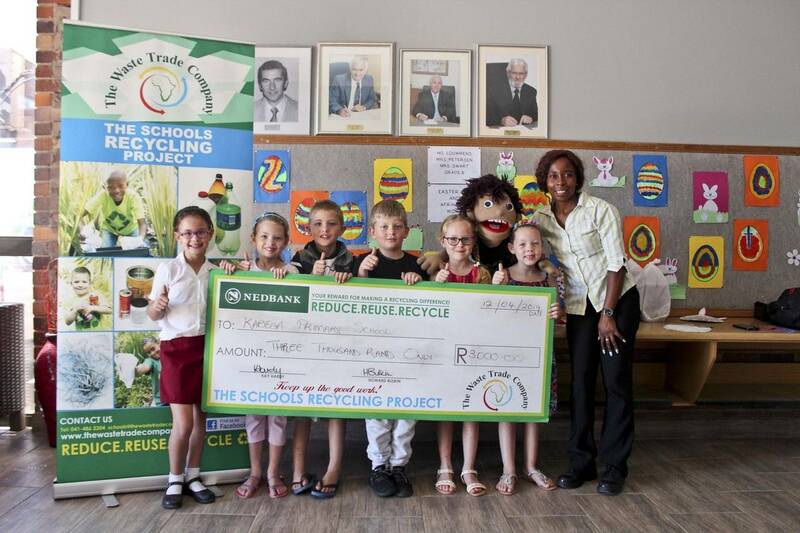 They managed to collect a total of 715kg of recycling for the first term, an average of 10.67kg per learner. They have vowed to work even harder to ensure that everybody at school recycles. Theador Herzl High was awarded third place for collecting 1544kg of recycling, an average of 10.29kg per learner. They will be investing in small recycling bins for each classroom to encourage learners to separate at source. TWTC would like to thank Mpact Recycling SA for the donation of the prize money, the top 3 schools for their dedication and hard work and everybody in Port Elizabeth, Uitenhage, Despatch and Sundays River Valley who continues to reduce, reuse and recycle!